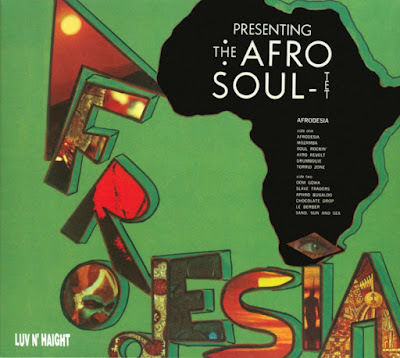 "Afrodesia is the lone album by the Afro-Soultet, which may or may not have been officially released by Banyon sometime between 1968 and 1971 (no one still breathing can remember the exact date). What we do know is that Johnny Kitchen (aka Jack Millman) licensed the record to Banyon's Betty Chiappetta (Vee-Jay Records), and the record received a test pressing. The Afro-Soultet originally hailed from Texas and recorded several albums under the name Afro-Blues Quintet +1, who had previously recorded three albums and seven 45s. After some personnel changes, the band relocated to L.A., where Millman caught them playing the Living Room. ... Afrodesia is a true lost classic and belongs in any soul or Latin jazz collection, as well as in any serious groove digger's crate. ..."